Good oral hygiene begins at birth! Pediatric dentists recommended cleaning your baby’s gums – even before the first tooth appears – with a soft infant toothbrush. The Kidsme Easy Held Toothbrush Set helps children learn good oral hygiene at a young age with two effective brushes. Both brushes work to remove sugars and bacteria that lead to future decay. 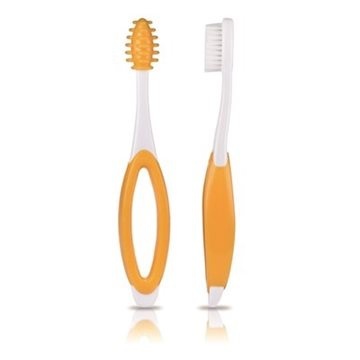 Rubber Bristles Brush – gently massages and cleans the gums. First Brush – carefully cleans a baby's first teeth with soft bristles.